‘The Great Game’, that shadowy 19th century ‘cold war’ between Britain and Russia, has held a fascination for me since reading ‘Kim’ as a boy. Courageous men, often in disguise, secretly mapping the high passes and kingdoms of Central Asia and pitting their wits against the murderous tribes and potentates they found there. The gambles they took in their quest for adventure and fame, in lands unknown and so far from any back up, and the prices often paid, make for reading that’s always riveting and often blood curdling. Through the 20th century the region was homogenised by communism, the kingdoms and khanates turned into oblasts and collectives and the colourful remnants of the silk road have all but vanished. Nowadays, in Kashgar, the Han Chinese are slowly outnumbering the indigenous Uyghurs and others and the few historical buildings left are being removed to allow for apartment blocks. But Kashgar still has what is reputedly the biggest animal market in the world, and that part of Central Asia remains a staggeringly vast area of thinly populated desert, steppe and mountain; space to get truly lost in. I’ve had many expedition ideas in my mind over the years but buying a horse or camel in Kashgar’s market and heading out into the emptiness for 3 months or more has never slipped out of the top five. And now the time has come. Ayelen’s ready and I’m ready. We have no money for the other ideas that might have occupied us this winter and by hitch-hiking the last leg from Kyrgyzstan we can get there on the cheap. How many pack animals we can afford, we’ll just have to see. And in which direction we head will depend on altitude, grazing and, probably in no small measure, the police (avoidance of). We’ll take whatever filming equipment we can rustle up in the next few weeks but no GPS or satellite phone. Back up is for saps, and we can’t afford it anyway. And no map. We don’t want to be led by a map. We’ll simply follow leads as they are presented to us by the people we meet along the way, see where we end up. The less plan there is, the less can go wrong…surely? It’s going to be very very cold to begin with and we don’t have a lot of kit, nor the dosh to buy a lot. But how much do we really need anyway? I’ve felt for sometime now that everyone just gets bogged down with the apparent need to have the very latest and best all the time. Human nature I suppose and it was no different in Captain Scott’s day when there was still only a choice between animal skins, wool and cotton. But really, is a RAB sleeping bag worth £400+ really necessary when the locals are sleeping in blankets? Ok, if I was looking at carrying those blankets on my back then yes, probably. But we’ll have horses, or camels. And OK, it’s going to be bloody freezing there in February and March, night time temperatures as low as -25C, but blankets beneath us for a mattress and lots more on top as a duvet – job done, surely? In fact it wouldn’t be a bad idea to not use or wear any modern-looking kit. It’d make us more approachable to the locals and less likely to attract unwanted attention. 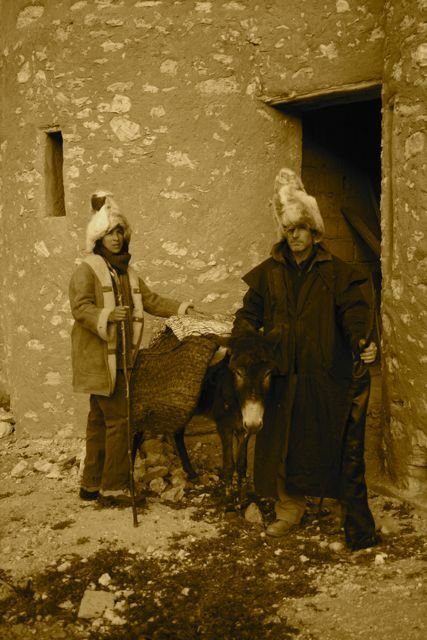 I mean, check out the clobber on the (in)famous archaeologist Sir Aurel Stein and his men on his way to plunder the lost civilisations of the Silk Road in around 1916. Almost certainly he would have taken with him the finest outdoor gear available, perhaps even tailored specifically to the task at hand by some reputable gentleman’s outfitter in Piccadilly. But there’s not a stitch of gore-tex or micro-fibre in sight. These boys will be wearing wool next to the skin and a closely woven yarn of wool or cotton to keep out the wind, snow and rain. Stein himself might have opted for silk undies but the others will be taking the maddening itch of course wool around the goolies in their slightly less well off stride. Wool keeps you warm even when wet and has the added advantage of not smelling too bad even after weeks without washing. And now take a look at Ayelen and I after a few minutes rooting around in our fancy dress box. Those outrageous hats are in fact reindeer skin gloves left over from the last time I was in extreme cold. 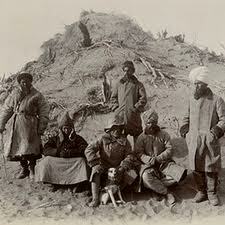 In 2005 I was part of a team re-enacting, in Greenland, the 1911 race to the south pole. We spent 90 days in temperatures as low as -38C with windchill way below that and wore – with the exception of boots and gloves – nothing but wool, tweed and gaberdine. And we were fine. None of us washed for the entire time save for occasionally rubbing certain areas vigorously with a handful of snow and yet upon our reappearance in civilisation nobody recoiled from our stench. I’m not saying we would have stood up well to a close sniff but despite all the exercise we’d done there was no sign of that cloying reek that hangs in an invisible mist around some tramps. You have to think about these things. Back to the hats..well we won’t be taking them for they’re just too silly but I don’t reckon we need to be buying much either. I think a handful of thin wool underwear and polo neck jumpers as layers to add and remove as required, a really thick jumper for the evenings and a good windproof and we’ll be done! Yup, I think we´re ready to go! It’s time to buy flights.